Materials research cannot progress without a way for researchers to access and use existing materials data. Since its inception over six years ago, the Materials Genome Initiative (MGI) for Global Competitiveness has facilitated a number of technical accomplishments that rely on data sharing and analysis. 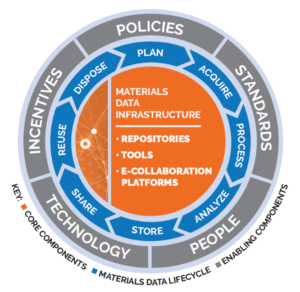 Now, The Minerals, Metals, & Materials Society (TMS)—one of the original champions of the MGI—has published a report that embraces the data-based future of materials research and outlines actionable steps to help create a robust, sustainable materials data infrastructure. “Data-driven innovation” is no longer a buzzword to describe the future of scientific and engineering progress; as we look to the future, we are able to see how a materials data infrastructure can accelerate the discovery, development, and deployment of advanced materials. The recent TMS report, Building a Materials Data Infrastructure, acknowledges that materials data play a crucial role in addressing challenges and securing competitive advantages across all sectors, including national security, healthcare, clean energy, and advanced manufacturing. 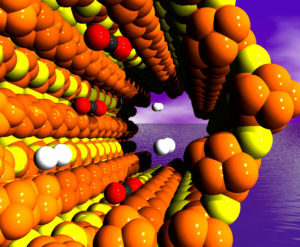 The report offers a blueprint for establishing a future materials data infrastructure (MDI) that will aid the materials science and engineering community in harnessing the rapidly growing quantity of technical data generated by computations and experiments. Because it provides a sustainable mechanism for storing, retrieving, discovering, and sharing enormous amounts of digital data, the MDI is essentially a strategy for protecting investments in innovative research and development. More and more individuals from the materials community are accepting that data-driven innovation in advanced materials can come about only by creating an MDI. Yet one question remains: how will the community store, access, and share data using this infrastructure? Having a clear definition of the MDI will ensure everyone is on the same page. The TMS study presents one simple, yet important, point: data tell stories. Data reveal opportunities and shortcomings, and help us recognize patterns, relationships, and trends to drive our decision-making. If materials data encourage further accomplishments as part of the MGI, then the MDI is the key to unlocking the new generations of expeditious materials discovery, innovation, and economic prosperity.